Blood Orange Baked Salmon. Recently, I was shopping at Trader Joe’s and I saw some colorful blood oranges in the produce section. I usually buy blood oranges around Christmas and New Year’s as a tradition. Blood oranges are so stunningly pretty that I had to find a new way to use them. My husband loves baked salmon. I’m guessing that if he had his choice, he would eat baked salmon, steamed broccoli, and brown rice every single night for dinner. I thought about serving this salmon over rice and with some broccoli on the side. However, we eat a lot of rice already. 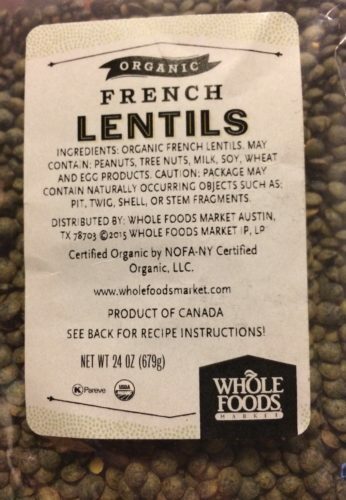 My husband also likes lentils and I had a big bag of French lentils that I needed to use. 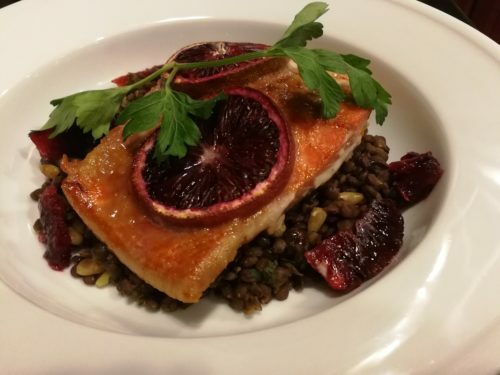 So why not salmon over a bed of lentils instead? The blood orange itself has a sweet and tart flavor not to mention a gorgeous reddish purple flesh. I wanted a sweet and savory type of marinade for the salmon. 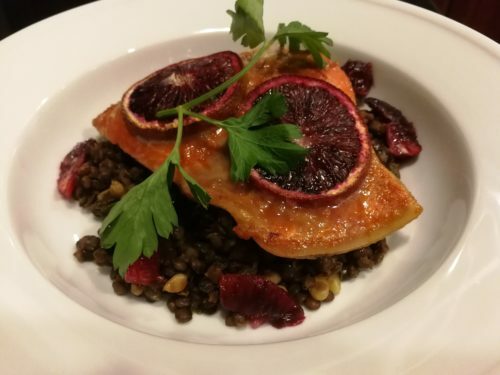 One of my favorite all time dishes was an orange-glazed salmon that I used to order at a local French restaurant called Le Tire Bouchon in Fairfax, VA. That salmon was very tasty. Normally, for a citrus salmon recipe, rather than marinating the salmon, I would instead make a buttery citrus sauce on the stove. For this recipe, the salmon is marinated so that the blood orange flavor permeates the salmon flesh. 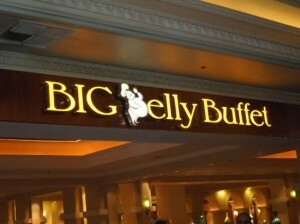 And it’s heaven. Start by marinating some wild skin-on salmon pieces. I usually buy my wild salmon at Giant Food‘s seafood department. Even the frozen sides of wild salmon are great quality and they go on sale often. The salmon marinade is simple to make. Just zest two blood oranges and then squeeze their juices into a medium-sized non-metallic bowl. Add the zest to the bowl. It’s easier to zest the oranges before you juice them. Now add some water, finely chopped fresh ginger, minced garlic, Dijon mustard, honey, light brown sugar, cayenne pepper and salt to the mixture. Whisk the marinade. Now cut the salmon into fillets leaving the skin on. Marinate the salmon pieces, flesh side down, for at least an hour in the refrigerator. Be sure the marinade covers the salmon flesh. Cover the bowl with plastic wrap. While the salmon marinates, make a pot of French lentils according to the package directions using some fish stock in place of the water. When the lentils have finished cooking, mix in some chopped dried cherries, toasted pine nuts, and finely chopped Italian parsley. Set aside and keep warm. Slice one blood orange and set aside. Peel and section another blood orange. Remove the membranes from each section and set aside. You’ll use the sections to garnish the dish. Transfer the marinated salmon pieces, skin-side down, to a parchment-lined baking pan. 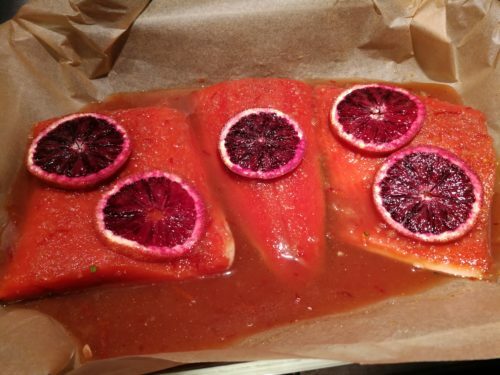 Pour the marinade over the salmon pieces and top them with blood orange slices. Bake the marinated salmon at 400 degrees Fahrenheit for 10 minutes or until the salmon is done to your liking. Serve the baked salmon over the lentil mixture. Garnish with the blood orange sections and sprigs of fresh Italian parsley. Try my other fish and citrus recipes including Grilled Tuna with Orange Ginger Sauce and Baked Salmon with Creamy Citrus Herb Sauce. 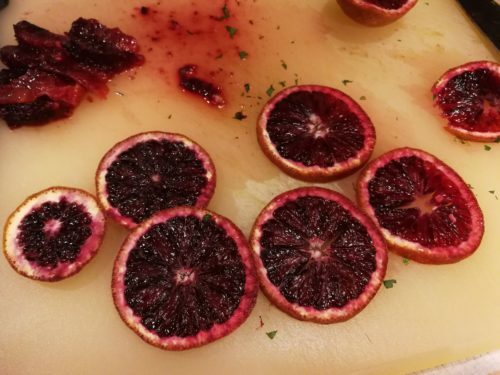 Also, if you have some extra blood oranges, try my Festive Blood Orange Martini. 1. In a medium bowl, whisk together the blood orange zest and juice, water, ginger, garlic, mustard, agave syrup, brown sugar, cayenne pepper and salt to make a marinade. 2. Put the salmon pieces, flesh side down, covered by the marinade in the bowl and cover with plastic or a lid. 3. 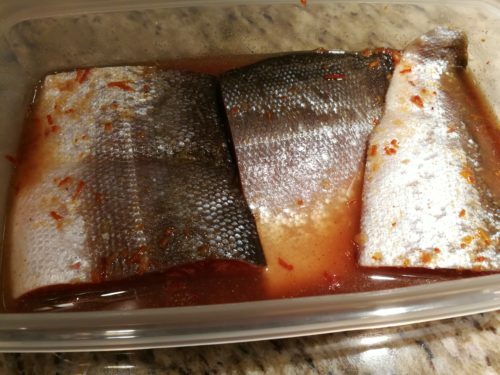 Marinate the salmon pieces for 1 – 4 hours in the refrigerator. 4. While the salmon is marinating, preheat your oven to 400 degrees Fahrenheit. 5. In a 4-quart sauce pan, cook the lentils in the fish stock or water according to the lentil package directions. 6. 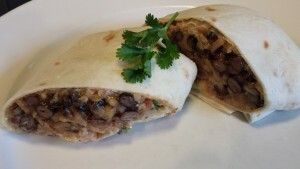 When the lentils are done, mix in the dried cherries, pine nuts and chopped Italian parsley. Keep warm. 7. Place the marinated salmon pieces, skin-side down, on a parchment lined baking sheet. 8. Pour the marinade over the salmon pieces. 9. Bake the salmon for about 10 minutes or until done to your liking. 10. 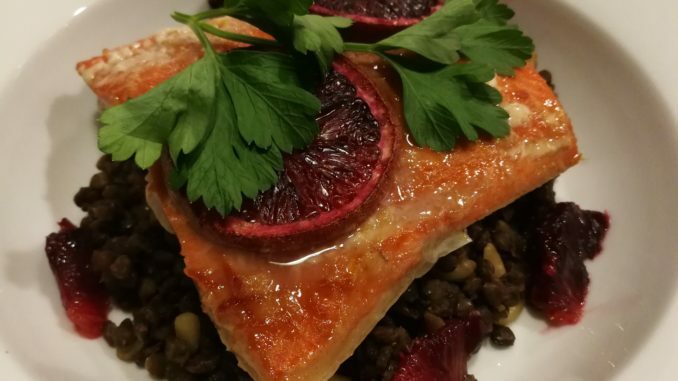 Serve the salmon over a bed of the lentils in a shallow serving bowl. 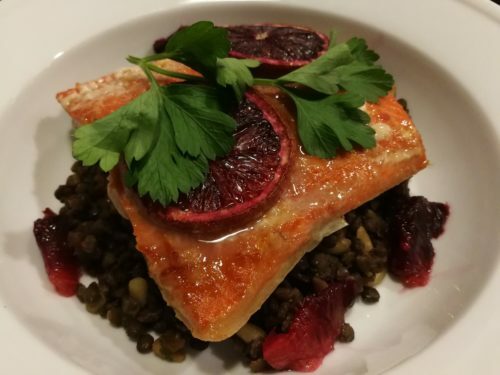 You can spoon some of the salmon’s baking juices over the salmon and lentils. 11. Garnish with blood orange sections and parsley sprigs. Serves 2 or more as a main course. Offer with a side salad for a refreshing meal. Dry white, rose, or red wines all go nicely with this dish. I made three pieces from a 1 lb side of salmon for the original photos for this dish. The third piece went to work with my husband for a chilled lunch along with some leftover lentil mixture. Variations: Use a different firm fish such as halibut as a replacement for the salmon. Valencia juice oranges can substitute for blood oranges if you can’t find blood oranges. Use some finely chopped fresh rosemary or tarragon with the lentils instead of the parsley. Add a splash of Gran Marnier liqueur to the marinade for an extra kick. Try toasted pistachios instead of pine nuts. Dried cranberries can be substituted for the dried cherries for a tangier flavor. The leftover lentil mixture is great chilled for a quick lunch.